May is almost here with only a few days to go before we leave on the May 2015 Lecce Italian Language Experience. Interested in our detailed program for May? Just open this link. Detailed program - May 2015 Lecce Italian Language Experience. You also have the chance to come along for the ride and vicariously enjoy what we get up to. How? Simple really. All you have to do is "Like" the Learn Italian in Lecce Facebook page. Just click on the following link and select "like". 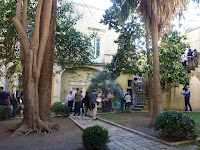 Facebook page - Learn Italian in Lecce. Still considering coming in September? Find out more - The 2015 Lecce Italian Language Experience - September.